A “picture is worth a thousand words” is still very true today. A Sketch is a way of capturing all of the ideas from the Vision planning, through the Programming, and then into a 2 dimensional floor plan…..clearly showing hundreds of ideas in a simple pictorial diagram. This milestone transitions all of the ideas spoken verbally, and then written down in text, into a picture that everyone can understand. 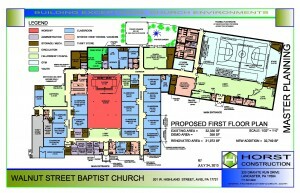 With the use of color indicating the different functions and programs, this Sketch can easily show how the new facility will be improved and inspire everyone within the organization at this time. They can see how their ideas have been incorporated into a plan that is actually t aking shape, and becoming a “real” project. Everyone can also see how the new ideas, programs, and growth of the facility are being planned…which should be very exciting. The Sketch will also show the Master Plan and different Phases…reflecting the “dream”. This Sketch should show how everyone’s ideas were incorporated into the project….possibly not in the first phase, but ultimately in the Master Plan. Since they have been “heard” and not ignored in this journey, they should feel part of the team, increasing their trust and faith in the future of the organization. This should ultimately increase their desire to help support the project financially, as they can see the “talk” develop into the “walk”.